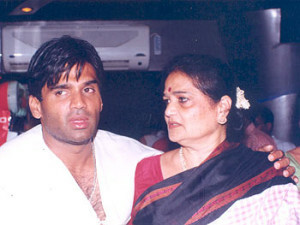 Suniel Shetty was born on 11st Aug in Mulki, Karnataka in a Bunt family. 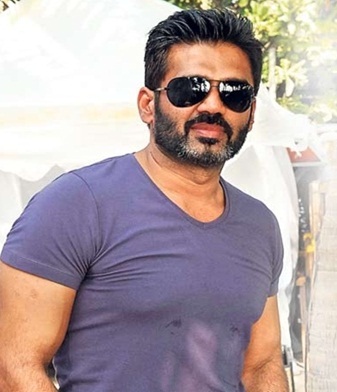 His birth name is Sunil Shetty and recently changed his name to Suniel Shetty due to numerology reasons. He made his acting debut with Balwaan in 1992 alongside with Divya Bharti, Danny Denzongpa and Tinnu Anand. His villain role in Dhadkan 2001 was much appraised by the film critics and he won Filmfare Award for Best Villain. In Celebrity cricket league he is leads Mumbai Heroes team. Recently the actor ventured into restaurant business and clothing line. His father Veerapa Shetty is from Mangalore, Karnataka. His mother is a home maker. He has a sister named Sujata Shetty. His wife Mana Shetty, born in August 1965 is a Fashion designer and social activist. Her father Iftikhar Mustafahasan Kadri is a popular architect of Mumbai and her mother Vipula is a social worker. She has a sister named Isha and a brother named Rahul. 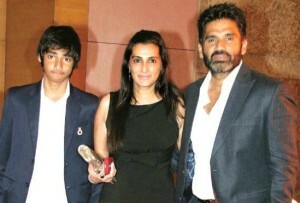 She married Suniel Shetty in 1991 and the couple have two kids. 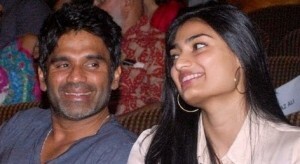 Sunil Shetty and Mana Shetty gave birth to two kids daughter Athiya Shetty born on 5th Nov 1992 and son Ahan Shetty born on 15th Jan 1996. Their daughter Athiya Shetty started her acting career with Bollywood film Hero in 2014 opposite Govinda, Vinod Khanna and Sooraj Pancholi.